Low prices. OrangeSmile.com offers car hire service in New Zealand on the lowest-rate-guarantee basis, since we work with car suppliers directly. For your search criteria in New Zealand, we always select and show the best rental offers. The car reservation process consists of 3 simple steps: (1) search for available cars for your dates in New Zealand; (2) select your car type; and (3) fill in the booking forms. Once the reservation is completed, you will receive a confirmation voucher to your email address. During the booking process, please check your rental conditions. To pick up your car at the rental point in New Zealand, you need to provide our confirmation voucher, your driving license and a valid credit card. The final payment is normally carried out at the pick-up point. Our car hire points in New Zealand accept VISA, MasterCard, etc - please check your rental conditions. At the pick-up point, please read the handling manual and check the car for present defects. OrangeSmile.com wishes you a pleasant journey to New Zealand! The car hire reservation system OrangeSmile.com allows renting a vehicle in New Zealand within 10 minutes. Our largest database of car suppliers enables us to provide you a rental car in New Zealand at the cheapest rate ever possible. At rental locations in New Zealand we offer the following car sizes: mini, compact, economy, standard, premium and luxury. The following car types are available in New Zealand: Sedan, Hatchback, Jeep, Cabriolet, Coupe, Minivan and Minibus. Stunning, simply breath-taking nature remains the main distinctive feature of New Zealand. The territory of the country is home to 10 national parks, and even streets of modern cities simply dive in greenery and blooming flower beds. Te Ika-a-Māui was called one of the most beautiful places on Earth. The island features snow-capped mountains, sleeping volcanoes, spacious green fields and hundreds of geysers. There are many beaches on the coast of the island; this place is almost always crowded with vacationers who mix sunbathing with excursions to nature reserves. 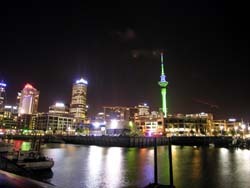 Travelers, who are hungry for bustling city life, will find all they need in Auckland. This city is rich in cultural centers, shops, restaurants and many other entertainment facilities. The most famous and visited museums of Auckland are the Museum of Auckland, which exhibits a rich collection of historic artefacts, the National Marine Museum, the Museum of Transport, the Botanic Garden and the Zoo. Kafia and Raglan regions also have the right to be called landmarks of the North Island. These beach areas have become a true mecca for all surfers. There is one more landmark near Kafia - Bridal Veil Falls, tremendously beautiful waterfalls. Travelers are also recommended to visit Te Puia Hot Springs, Te Koutu Park, Te Toto Gorge and Waitomo Caves. Stephens Island is located between North and South Islands. This small island is home to many rare animals. In tropical forests of Stephens Island one can see tuatara, a close relative of dinosaurs, which are extinct many million years ago. The island is a restricted zone, and the area, where the unique reptile lives, is put under strict control. Local biologist work hard to keep that rare animal and ensure it won't disappear in future. Blenheim is the most popular and widely visited city of the South Island. The best way to get acquainted with historic heritage of the city is to visit the Seymour Square area and during an excursion in Museum Park. Pollard Park is also a very interesting destination in Blenheim. The park is mostly famous for a large collection of roses and camellias. If you visit the city in February, you will be able to participate in a very unusual holiday dedicated to the grape. The theme of the celebration is not random as during several centuries Blenheim has been the main centre of wine making on the island. Dunedin is the second largest city on the South Island and home to several beautiful medieval buildings. Larnach Castle is usually called the most famous landmark of this place. Visitors are also very welcome in the Museum of Otago, the Museum of Natural History, Dunedin Gallery and Botanic Garden. The insurance deposit amount in New Zealand is defined by the rental office and is based on the highest franchise of all included insurances. Make sure to check the documents issued by the rental office and compare them with your voucher. Prior to signing the documents check that the documents and the rental invoice match the data in your voucher.